UTSA doctoral candidate Jewel Barnett ’14 hopes to impact public policy with her food insecurity and health research. (Dec. 8, 2017) -- Meet Jewel Barnett ’14. When this first-generation student walks across the stage at Commencement this December, she will be celebrating both academic and personal achievements. Barnett decided to attend UTSA after going through a recovery program at the homeless shelter, Haven for Hope, in San Antonio. While attending the program’s different sessions, she realized she wanted to study counseling. “I was receiving counseling and knew I wanted to give back and help others by doing this type of work,” said Barnett. After meeting people at Haven for Hope who believed in her, Barnett enrolled in the Master of Science degree program for Clinical Mental Health Counseling at UTSA in 2012. Before completing her master’s program at UTSA in 2014, Barnett knew she wanted to continue her education and earn a Ph.D. in a health-related field. A work-study job at the UTSA Downtown Campus unexpectedly led the then-master’s student to applied demography. Barnett took a position as a graduate research assistant in the UTSA Institute for Demographic and Socioeconomic Research (IDSER), which is under the direction of Texas State Demographer Lloyd Potter. In this role, she collected data and worked on state and federal projects with doctoral candidates. Today, Barnett is pursuing her Ph.D. in applied demography and Potter is her dissertation chair. Barnett says that Potter has been instrumental in her success as a doctoral candidate by sharing his expertise as she conducts her own health-related research. 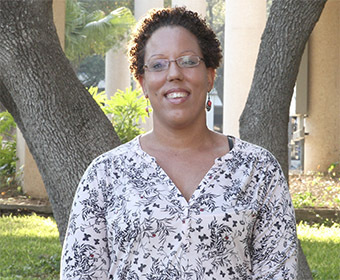 As a person who has experienced both food insecurity and homelessness before attending UTSA, Barnett’s dissertation focuses on the impact of place and food insecurity as it relates to childhood obesity outcomes. Reflecting on her time at UTSA, the Roadrunner says some of her most memorable moments came from when she presented her research at conferences. During the Spring of 2017, Barnett presented research at the UTSA Applied Demography Conference, hosted by IDSER, on the impact of socioeconomic determinants on children living in households receiving food stamps in the United States. She’s also presented her research at the Southwest Social Sciences Association’s annual meeting in Austin. Both conferences gave Barnett the opportunity to network with people doing cutting-edge research in her field. Looking ahead, the UTSA doctoral student says the coursework and skills she gained while at UTSA are setting her up for success. In the future, she plans to continue her research on food insecurity and childhood health. Learn more about the UTSA Department of Public Policy and its Department of Demography. Learn more about the UTSA Ph.D. program in applied demography.